Driving across the West Texas Plains is nothing new to me. I have spent much of my adult life driving from New Mexico across the border to cities in West Texas but this return trip to New Mexico felt more like a victory parade than a casual drive. On June 28th fifty students and teachers piled off a sixteen hour bus ride from various parts of the Mexican state of Sonora. I have to admit that I had no idea what to expect. I had been asked to build an exchange program for students from the State University of Sonora and I had done just that, but the students and faculty to take part were simply names on a roster. Little did I know how the month would go. 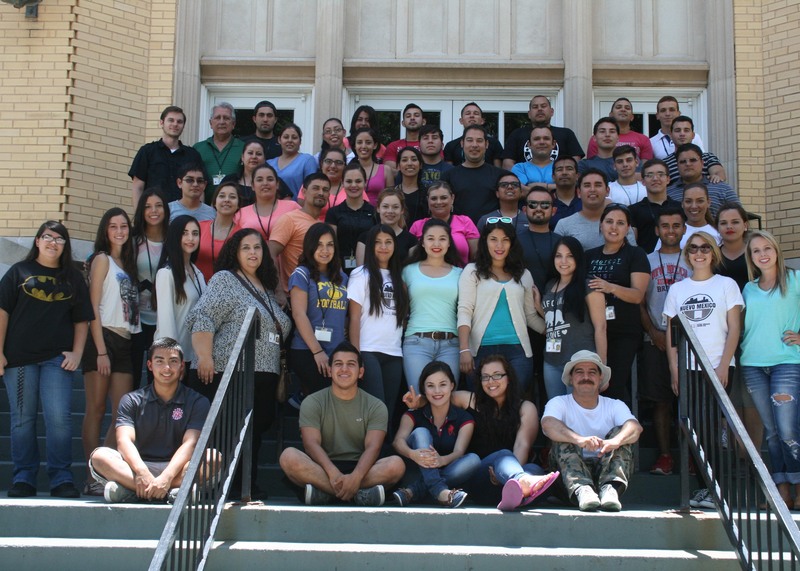 Students and teachers at a State University of Sonora campus. Driving along the Llano Estacado, following a bus with Mexican plates I feel right at home. This area is where I grew up, right across the border in New Mexico. While I felt right at home, clearly it was new territory for the students from Mexico. They had come to the states, learned some English and more than anything about themselves. Exchange programs like this one are crucial to understanding other cultures and folks that think a bit differently. Admittedly, Americans, Canadians and Mexicans have very similar cultures and it is easy enough to move through the three countries and have a basic understanding of each others faith, language and generally our thought process. Much of our perceived difference is really similarities disguised by a different language or way of living. Not to say that we don’t have differences, we do. Much as a Californian has a different way of thinking than someone is from Minnesota where I was born. New Mexico is a unique mix of cultures and I will be the first to admit that I see value in this mixture. I grew up with a diverse culture, two languages and best friends that did not look like me. However, the differences in a businessman from Hermosillo, Sonora vs. a businessman from Tucson are likely less stark than we would believe. Teachers face similar struggles in student learning in Chihuahua as they might in Saskatoon. The beauty of an exchange and meeting other people is that you learn how very similar we are. Once the language barrier is taken out of the picture, similarities abound. They love their children just as much as I love mine, they care about the future of their nation just as I care about mine, they smile, laugh, have fears and hopes…just as I do. Since this event in 2015, so much has come to pass. The peso has lost much value vs. the dollar, the political climate has shifted and we are left as North Americans to consider our future together. To be clear, it is a future together. We are neighbors and we are old friends, although sometimes cranky neighbors. We handle things differently and much like squabbling children, we have all made mistakes, said and done things we would like to undo. But our future is to be written together. We are neighbors and we will work together for generations to come how well we succeed together is the question at hand. The future will be written by the students who came to this exchange in New Mexico, the Americans who travel to Mexico for business or vacation and the Canadians who welcome us to their country and are equally visiting ours. This is the future and it is unavoidable, inextricably and unquestioningly together. The students who came from the State University of Sonora learned teamwork at NMMI, but in their time here they taught us much about ourselves and came to better understand our Independence Day when they learned about American independence and watched our fireworks. They better understood why we are proud to be American. They also explained Mexican independence, which was them throwing out two European powers, Spain and France. We are a tenacious continent full of firebrands…and that might explain some of our squabbles. So, as students visited Lincoln and learned about the Lincoln County War and Billy the Kid, they came to appreciate the struggle that our ancestors went through in the West. Additionally, when we visited Fort Stanton they learned of two dark chapters in American history, in the mistreatment of the native population, and the Confederate forces who took this fort and claimed Southern New Mexico in the early years of the Civil War. There are similar dark chapters in Mexico’s history. One of which is still underway in their war on the gangs and cartels that prey on their young for new members and constantly work to undermine the freely elected government in Mexico City and the States. They are not our enemy in the War on Drugs, they should be our ally. When you look at these pictures, realize that they are Mexican citizens who are going to college, working hard and building a stronger Mexico. When we make blanket statements, they are not only unfair, but they serve to undermine our relationships with our two neighbors. These folks are building a stronger North America. Lets stop squabbling and take time to understand their strengths and struggles as they understand ours. An economically strong Mexico stems illegal immigration naturally, it builds a bigger table. It’s a table and a meal that we are setting for our children and grandchildren. Let it be a table of peace.